When I first started on this “raw adventure”, I realised that one of my kids’ favourite dishes was half raw! 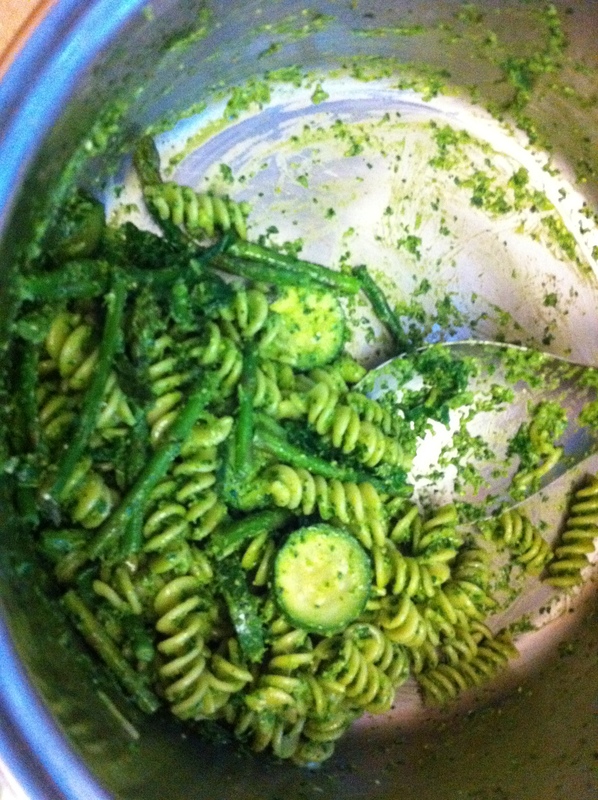 Pesto, my kids loove it! Cut off the long storks on the basil and parsley. Bruise and peel garlic. Pop all the indigence into your food processor or blender and blitz it until it is smooth. To add more raw goodness to your meal, add chopped young asparagus, thinly sliced mushrooms, ribbon-ed kale, zucchini slices, green beans, strips of red capsicum, broccoli florets…. the choices are endless! Heap on top of your favourite organic pasta (cooked of course!) or raw zucchini spaghetti spirals. Yummo! This is the kids’ unceremonious meal…..
To store leftover pesto: pour pesto into a clean glass jar, tap gently to settle the contents and then cover completely with cold pressed extra virgin olive oil (about 1cm). This helps to seal in the goodness and stop oxidization. I store mine in the fridge and have kept it successfully for up to 4 weeks this way. Be careful though, if it’s not completely covered with oil, it will go off fast.